Focus on writing keyword rich descriptions, building authority by increasing followers and finding less served niches to maximize your content's ranking on the popular social network. It’s not hard to make the case that Pinterest is a perfect social network for marketers, and Tailwind CEO Daniel Maloney hit upon the crux of the matter during a session this week at SMX East in New York. Pinterest is about who I want to be. And the smart marketers are trying to figure out ways to get their product in front of Pinterest users — estimated to number more than 50 million, roughly 70% female. One of the more neglected tactics is Pinterest search optimization. 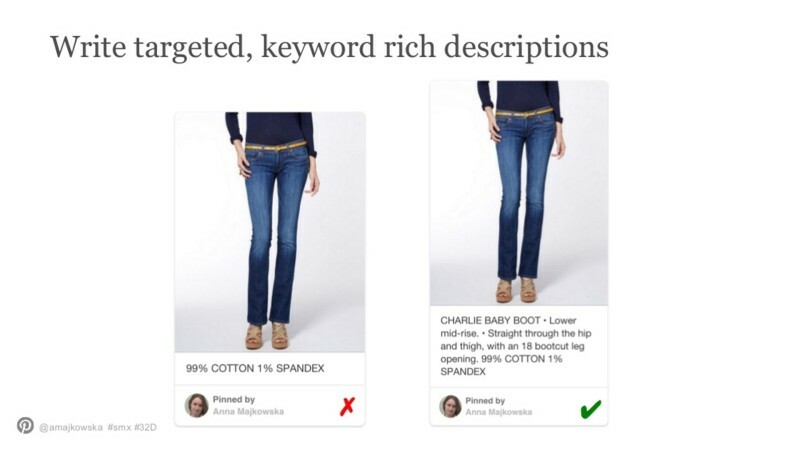 In April, Pinterest overhauled its search engine, introducing Guided Search. Pinterest CEO Ben Silbermann said Guided Search would help users sift through the 30 billion pins (that had been made at the time) to find things they didn’t know they were looking for. For obvious reasons, make sure your business’ name is in the account name and user name. Write a strong description about your business; include a good number of searchable keywords, but make sure it reads well. 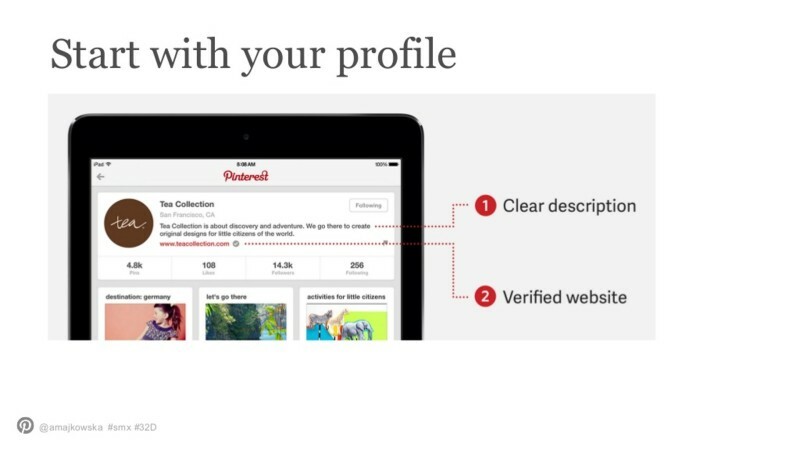 Verified Pinterest accounts have more authority in Pinterest search. This page has instructions about how to complete the process. 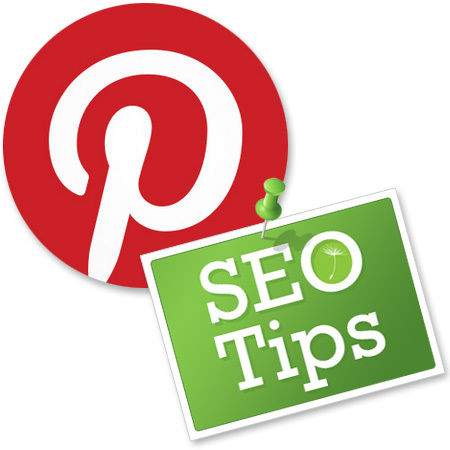 Encouraging users to pin content from your website primes the Pinterest search pump. The more good pins you get, the better your authority and the higher your posts will rank. Make sure to fill the descriptions with searchable keywords that describe the product or page. But avoid sounding spammy, because the descriptions serve as captions. They are rarely changed by Pinterest users sharing them, but are less likely to be repinned or clicked upon if they aren’t appealing to humans. Also avoid using hashtags, which serve no Pinterest purpose. Too many, Majkowska said, and your content might be demoted in Pinterest search. 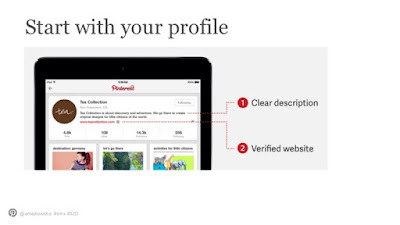 You should also take the same approach with descriptions in the names of Pinterest boards. And when naming boards stick with straightforward, simple names. 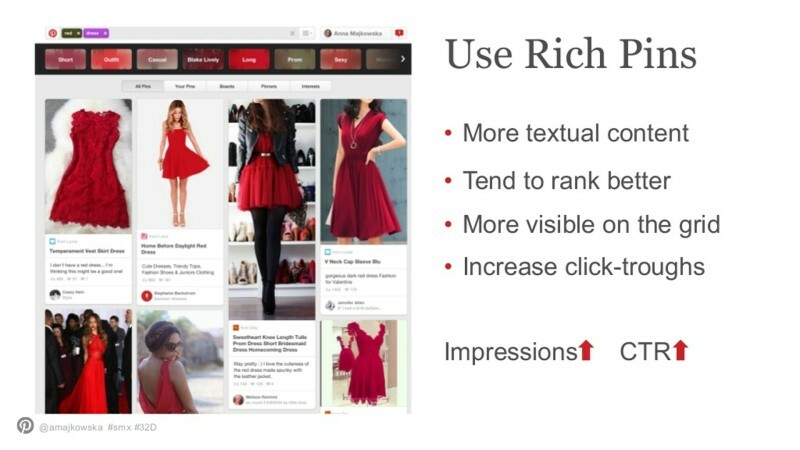 Rich Pins, similar to Twitter Cards, are a way to pull structured data from your site and display it on Pinterest. Depending on the type of Rich Pin, they can show price and availability for a product, ingredients for a recipe or address, phone number and a map for a place. Such content, Majkowska said, ranks higher in Pinterest search. 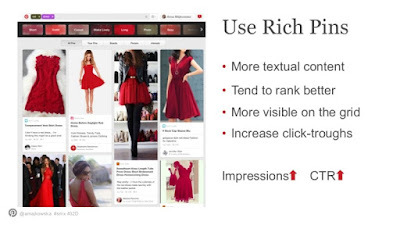 It’s also more visible in Pinterest users’ feeds and therefore has a higher click-through rate. Setting up Rich Pins for your site also should improve your results on Google, and other search engines, said another panelist, Brittany Richter, a paid social expert with digital marketing agency iProspect. The same markup Pinterest uses is used to generate rich snippets that display in off-Pinterest search results. Make sure Pinterest isn’t sending traffic to deleted or expired pages. 404 errors hurt a site’s search ranking and anger users. If you have a product that’s out of stock, add related items to the page. Add the follow button to your site, on as many pages as possible. Promote your Pinterest account on other social accounts. “The way it works is the more pinterest followers you have, the higher authority of your profile and your boards, and the more likely your Pins will rank highly in Pinterest search,” Majkowska said. If your topic is competitive, look for niches that have a high volume of searches, but a lower volume of content, such as mother of the bride dresses in the wedding category. Pinterest is still testing its Promoted Pin advertising product with a limited number of businesses, but those not in the test can start preparing by testing similar promotion on other social networks, Richter of iProspect suggested. Richter said retailers are posting roundups of their most popular Pinterest content on Facebook — “Get Pinspired! Shop some of the most-pinned items from our Pinterest page” and promoting those posts. “We’re actually seeing a higher click-through rate on things like this than when we use the multi-product ad unit on Facebook,” Richter said. Martin Beck - Author - Thanks for this great article!